When I started this project one year ago, my father chimed in with his own recommendations. After shooting off a few horror movies I had already seen, a dark look came over his face. 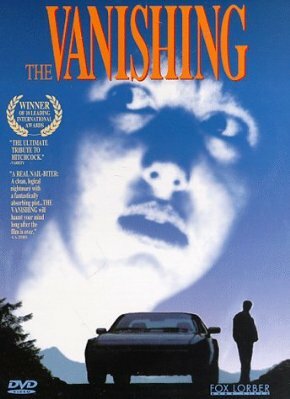 "You need to watch The Vanishing," he said. Dear Old Dad explained to me that the Dutch film isn't exactly a horror movie yet it is hands down the scariest film he has ever seen. He wouldn't explain any details of the plot except those I will repeat for you now: a couple is on a road trip, they come to a highway rest stop. The woman goes inside, she never comes out. She has disappeared. I really can't explain much more without giving anything away. The best way to approach this film is to go in completely blind. Knowing that it is Dutch and that a woman vanishes is about as much as you should know. I glimpsed the Netflix synopsis and even that gave away too much. Throughout the movie's runtime, I was frustrated. You ripped me off, Dad! I'm supposed to be watching horror movies, not European psychological thrillers! How will I explain this to my readers? But was it scary? Complain all you want about how this isn't a horror film, then watch the ending.